First advice: Do the initial setup/testing using HTTP. Once this is working, switch to HTTPS. Using Microsoft-Internet-Explorer, follow https://archive.sap.com/documents/docs/DOC-61430 . In my case I also had to add localhost to trusted-sites in addition. Unfortunately this refers to a deprecated MS-tool named makecert. The new tool is named New-SelfSignedCertificate (according to https://msdn.microsoft.com/en-us/library/windows/desktop/aa386968(v=vs.85).aspx ). Unfortunately I wasn’t able to transfer the settings to New-SelfsignedCertifacate. 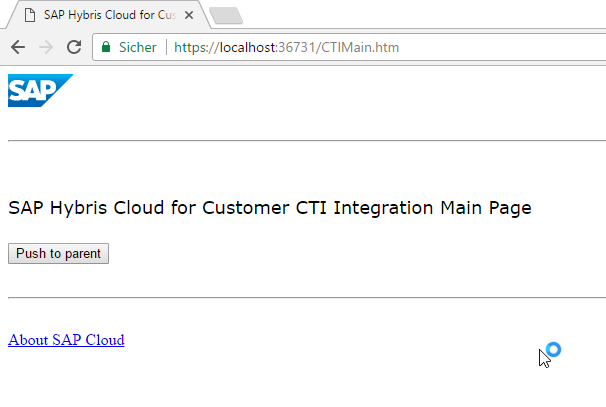 Solution in my case: My IT-Webserver-colleague created a webserver-certificate for CN localhost (Thanks Daniel). 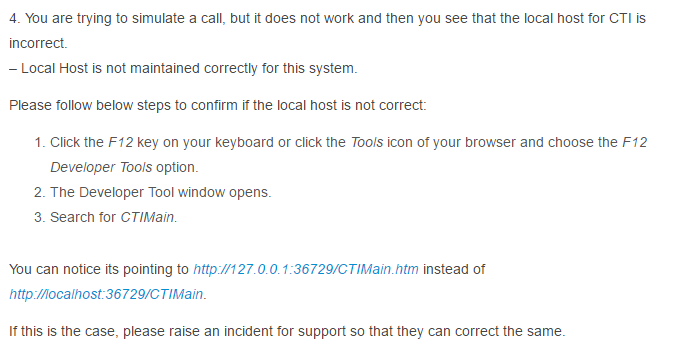 This has to be installed as Administrator (doubleclick) and saved to “Local computer” (not current user!). This fingerprint has to be copied to clipboard. Spaces have to be deleted, and it has to be “pure” ASCII. 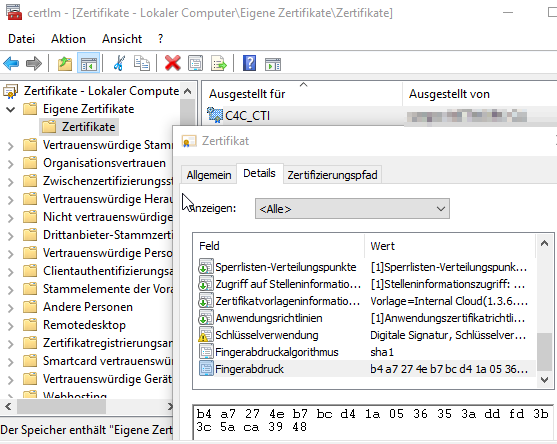 This will “connect” the certificate with the C4C-Client-Adapter. Important is, the green lock and the word “Sicher” = “Secure”. Everything else means, the certificate isn’t correct yet. 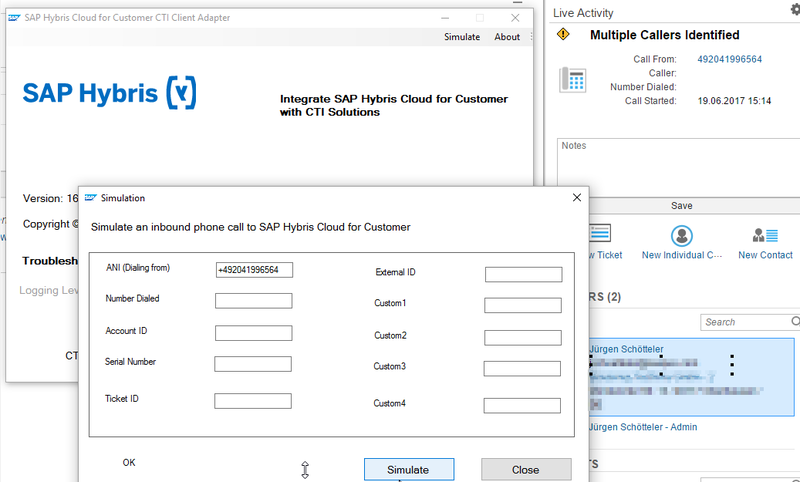 F12 – Developer-Tools & SAP-Support have been the solution in my case. Simulate Call works (Live activity is updated) and Webbrowser shows a “Secure” connection. (ongoing SAP-incident). Nevertheless it seems not to interfere the functionality. I’ll update this article, once this is fixed. 2) I intend to add another blog-article with details regarding Inbound-CTI-Setup using CISCO Jabber in near future.